The latter is strange news. The most recent types of 737’s should have the right range for serving those destinations. In fact, the Dutch company Arkefly (part of the Tui group) operates 737’s on its Amsterdam – Boa Vista route, a flight that takes 6,5 hours, much more than the Praia-Lisbon route, and the planes are full. Arkefly also uses the 737 on its Amsterdam-Fortaleza route, though with a refueling stop on Sal Island. So, what’s wrong with the TACV planes? Is TACV trying to carry extra cargo on top of the passenger’s luggage? That might just not be possible. 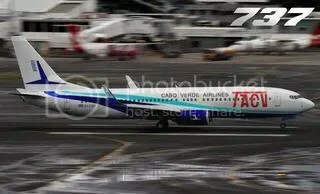 TACV is often painted in the Cape Verde press as inefficient and prone to mismanagement. Is this recent acquisition just another example and another missed opportunity for TACV? Let’s take a good look at the challenges that face TACV as well as the opportunities for the aviation industry in Cape Verde. TACV in fact faces multiple tasks with little equipment. The company first of all has to provide vital and continuous domestic links to and from capital Praia as well as to provide transport among the country’s many islands themselves, seven of which have airports. Secondly, TACV has to keep Cape Verde connected to its highly important diaspora in the US, Europe and Africa. And lastly, TACV has to bring in much needed tourists to the country, mainly from Europe. An almost impossible combination of tasks, but somehow they manage it. The company is always balancing on the verge of bankruptcy and the only reason that it still flies is political. TACV can’t fail or else the country loses badly from the loss of visitors. So the government bails out TACV time and again. TACV may also be a hostage of its many employees. The company has offices in Boston, Paris, Rotterdam and elsewhere and it must have a big back office in Cape Verde. It’s custom for TACV to call all passengers when their flights are delayed, which happens often on domestic routes. For this you need a lot of staff, while it could also be partly done by automated messaging. Internet booking is still not available, you have to contact an office in person. TACV does not even publish its timetable (though we at Atlantico Weekly do, see our Flightguide). Nevertheless TACV brings you where you want to go and it has a good safety record, which is important. But it is not a sustainable business operation and it costs the state a lot of money to keep it flying, money that could be spent on other projects. It has been argued that the company should give up its international routes and focus on its domestic operations. Indeed, the growing economy will no doubt lead to more domestic traffic, but the problem is not so much the lack of connections, but the lack of reliable connections. Due to the many and often last minute changes to the domestic timetable, the economy suffers. Businessmen may lose vital contacts or miss meetings and hotels are never sure when their guests arrive. Added to that another airport is in the pipeline for Santo Antão. No doubt an fourth ATR plane would ease the strain on the domestic timetable. But there are other options. The new 737s could operate triangular routes, for instance Lisbon – São Vicente – Praia – Lisbon. They could take domestic passengers on the São Vicente – Praia leg of the route, thus creating an extra domestic flight. And the 737s could be used on the route to Dakar and Bissau instead of one of the ATR72’s (which appears to be the case in TACV’s new 2012/2013 Winter Timetable, see Atlantico Weekly’s Flight Guide). But a 100% focus on its domestic network seems to be out of the question and not just for economic reasons. It would leave the country without flights to the Paris and Boston diaspora for instance. Many emigrants living overseas still have voting rights and any government cutting off their flights home will pay dearly. Abandoning international operations would leave Cape Verde at the mercy of European charter flights and TAP of Portugal. The latter would profit in the short run with a monopoly on connections between Lisbon and Cape Verde, but the company is about to be privatized. The only candidate for a takeover of TAP is Brazilian entrepreneur Eframovich, owner of Avianca Brasil and Avianca Colombia, who will no doubt focus on expanding TAP’s many profitable routes between Portugal and Brazilian airports. But TACV’s new timetable may be giving us some clues of the future. This time there were no surprises and no new routes. Just the traditional package of Boston, Fortaleza, Amsterdam, Paris, Lisbon and Dakar/Bissau. Is this the shape of things to come for TACV? Focusing on the domestic and diaspora markets and not so much on developing new tourist markets? Is that the reason behind the creation of the government working group? Find more cheap carriers in the EU to bring tourists, so TACV can focus on its diaspora routes? It’s a strategy that might work, but it would be a missed opportunity for TACV. Cape Verde offers a unique opportunity to the aviation market and with TACV the country has an instrument to grab that opportunity. Cape Verde lies in the center of a fast developing bundle of air transportation routes: halfway between the EU (and the Middle East) and Brazil and halfway between North America and Africa. North America and the EU are mature and affluent markets, but both Brazil and parts of fast developing Africa offer tremendous prospects for aviation. Brazil is a growing market and not just internally. It is sending out tourists and businessmen all over the world, while receiving lots of business travelers (especially in the oil and gas sector). Brazil also has a bright future as a tourism destination (Rio, the North East). In Africa there is plenty on offer. Angola alone is planning to receive millions of tourists in the future and has a burgeoning business traveler market (also in the oil & gas sector). US and EU based airlines have been opening up new routes to these countries over the last few years or are adding extra capacity on existing flights. TAM of Brazil and TAAG of Angola are expanding their international networks rapidly. But there may be such a high demand that direct flights on the North American or European routes to and from Brazil and Africa become pricey for lack of capacity (as some already are). Any Cape Verde based airline should think big and step in, starting to offer daily flights to and from the most important airline hubs in the northern hemisphere, such as Atlanta, New York, Amsterdam, London, Paris, Frankfurt, Milan, Istanbul, all within the 6 to 6.5 hour flight time range. Simultaneously, that same company could offer connecting flights to and from Cape Verde to hubs in the southern hemisphere, like Brasilia, Rio, São Paulo, Luanda, Johannesburg, Cape Town, as well as some future hotspots in Africa. Again all these flights fall within the 6 to 6.5 hour flight time range, which means they could be carried out by a fleet of Boeing 737’s of the latest models. Meanwhile these flights can also bring much needed tourists from Europe to Cape Verde, who do not need a transfer but stay a couple of weeks. Also the diaspora market would be served by this network. Yes, such a plan would need lots of investment and not in the airline alone. The airport that will be used in Cape Verde as the transfer hub, whether that would be Sal, Praia or São Vicente, would have to expand its facilities considerably in order to accommodate half a dozen planes at the same time. But it could on the other hand make lots of money from transferring passengers. These would need lounges to relax, hotels if they want to stay a couple of nights, restaurants, bars, luxury shops, casino’s, etc. Lots of people could find work on or around the airport. Is this possible? Don’t people only want direct flights? Well, take a look at Panama’s Copa Airlines. Its fleet of 737s serves a large number of US and Mexican cities to the north, connecting them to a string of cities in Brazil and other South American countries. It is a well used and inexpensive carrier for flights between the US and Brazil for instance, offering two five to six hour flights via a transfer in Panama City. So there you have an example. Cape Verde holds a trump card with TACV, even when its struggling. It can also exploit the geographic location of the archipelago. Cape Verde must think big, find an investor and grab the opportunity when it still can. It is no use to continue mourning the loss of South African Airways that used Sal in the past as hub, but moved to Dakar. And anyway, that ship has sailed. SAA is now looking to establish a hub in Accra, Ghana. Too bad, but let’s compete with them! If TACV embarks on a growth course, it will not have to shed staff. On the contrary, it will need more staff. But the government must step away from its management and let private and most likely foreign partners take charge. 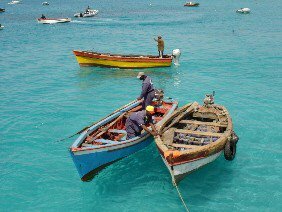 As a minority shareholder the government should keep the right to appoint a board member who guarantees Cape Verde’s national interest. As for airport development, the state company that runs Cape Verde’s airports, ASA, appears a well run organization. It must be capable of expanding the airport chosen to be the international hub by itself, while bringing in some international expertise. It may not even be necessary to bring in investors to ASA, which might become a tax cow for the government in the future, as it will be making money from transferring passengers and landing rights. October 29th 2012. All rights reserved by Atlantic Weekly/Rotterdam Week. Please note that Atlantico Business Development, the consultancy branch of Atlantico Weekly, is preparing a more detailed vision of Cape Verde’s Unique Aviation Opportunity. This will not be published, but it can be acquired by contacting atlanticoweekly at gmail.com.